The Star Wars Customizable Card Game (SWCCG) is a collectible card game based on the original trilogy (including ) as well as . It was created and released by Decipher, Inc.; however, Decipher lost its license to publish official products in 2001. 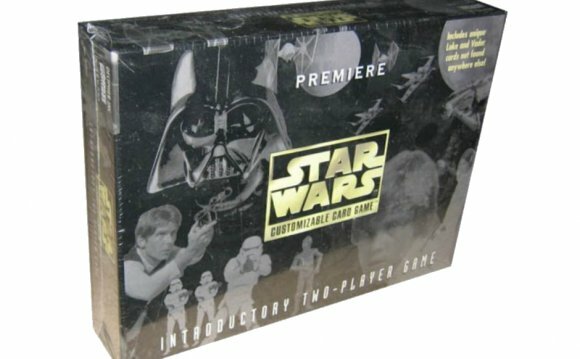 Star Wars CCG was first released in December 1995. Over the years, Decipher added eleven full expansions to the original card base, as well as numerous smaller expansions, special-purpose sets, and promotional releases. The last set, Theed Palace Limited, was released in the fall of 2001. The game spanned all of the original Star Wars trilogy (, Star Wars: Episode V The Empire Strikes Back, and Star Wars: Episode VI Return of the Jedi) as well as Star Wars: Episode I The Phantom Menace. During several years of the game's run, between 1995 and 1998, it was a top-selling CCG, second only to, according to the InQuest magazines. Decipher lost its license to produce official products in 2001; the CCG was replaced by Wizards of the Coast's Star Wars Trading Card Game. Decipher released over twenty expansions and small boutique products. Expansions are the way in which new cards are released to add to the game. Prior to Decipher's loss of license, a number of sets were officially announced but ultimately not released. A fifth set, Reflections Gold, was in development at the time that Decipher lost its license and, despite protests by the company, the cards were not allowed to be released to the public, even in a digital-only format. Over the years, draft versions of many of these cards have appeared on the secondary market and they are considered extremely rare. Compared to other trading card games (TCGs), SWCCG is complex and has a steep learning curve. It has more rules than other TCGs, with some of these rules being obscure and seldom-needed. Some of the basic concepts (such as the distinction between "battle damage" and "attrition" in battle) can be counterintuitive. On the other hand the basic mechanics are innovative and flexible, giving SWCCG a game depth that appeals to serious gamers. One other feature distinguished SWCCG from many other TCGs: while Decipher oversaw the game, no card was ever banned from tournament play. Instead, when a card or strategy was deemed abusive or too powerful, Decipher chose to release "magic bullets, " new cards which were specifically designed to counter the offending strategy. In some cases, Decipher also used errata, modifications to game text of a card that supersede the actual printed version. The use of errata also contributes to the steep learning curve, since players need to be aware of errata in order to use the affected cards properly. While other formats have been created, using a limited card pool, the original open format still has no card banned from play. Each game requires one player to play the Light Side of the Force, while the other plays the Dark Side. The objective of the game is to deplete the other player's deck. In friendly play, a player can specialize in one side or the other, but for tournaments, players need both Dark and Light decks. The action of the game occurs at various Location cards (both interstellar and planet-bound) from the Star Wars universe. Locations can be deployed as the game progresses; furthermore, most locations come in both Dark and Light Side flavors, and an on-the-table location can be "converted" (changed to the other side) at any time. Most locations affect game play in some way; all also provide "Force icons, " which represent the amount of "Force" — the game's resource — that a player can activate per turn.